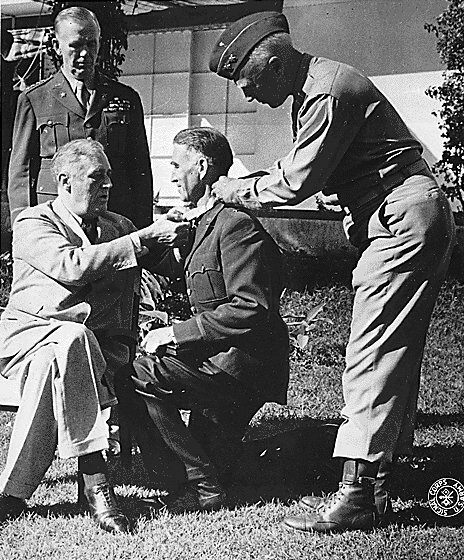 » Franklin Roosevelt awarding Brigadier General William Wilbur the Medal of Honor, Casablanca, French Morocco, 22 Jan 1943; note George Marshall in background and George Patton assisting. Photo 1 of 2. The Medal of Honor citation for (then) Colonel Wilbur reads: For conspicuous gallantry and intrepidity in action above and beyond the call of duty. Col. Wilbur prepared the plan for making contact with French commanders in Casablanca and obtaining an armistice to prevent unnecessary bloodshed. On 8 November 1942, he landed at Fedala with the leading assault waves where opposition had developed into a firm and continuous defensive line across his route of advance. Commandeering a vehicle, he was driven toward the hostile defenses under incessant fire, finally locating a French officer who accorded him passage through the forward positions. He then proceeded in total darkness through 16 miles of enemy-occupied country intermittently subjected to heavy bursts of fire, and accomplished his mission by delivering his letters to appropriate French officials in Casablanca. Returning toward his command, Col. Wilbur detected a hostile battery firing effectively on our troops. He took charge of a platoon of American tanks and personally led them in an attack and capture of the battery. From the moment of landing until the cessation of hostile resistance, Col. Wilbur's conduct was voluntary and exemplary in its coolness and daring.